So many wall chargers are available in the market, yet it remains tricky to find one that fits our specific needs coming from a brand with good reputation on quality. I was looking for a wall charger with AU plug, 2 USB ports, one of them must be QuickCharge 3.0, form factor of the charger must be slim and the port should not be downward facing. My search ended up with 2 candidates: Blitzwolf BW-S6 and Aukey PA-T13. I choose Blitzwolf because the price was cheaper and I found a good review on it with elaborate work on tearing it down and analysing the components inside. 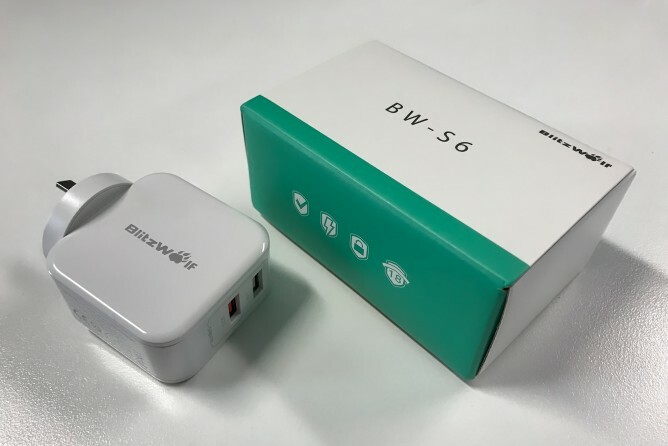 So I bought Blitzwolf BW-S6 wall charger with SPower technology. This charger works as expected and I never had problem with its temperature getting too hot while charging 2 devices at the same time. Form factor is compact and the build quality feels solid. The USB ports are facing forward instead of downwards, making it easier to use with on-desk power outlet. Happy with this purchase and will continue to use this charger as my main charger at work.